Fred Kim is a junior in the Industrial Design department at Massachusetts College of Art and Design. Like his peers, he’s been using 3-D printers — until just a few years ago, an almost unimaginable innovation — to render his concepts. Right now, though, he’s bent over a workbench in the grimy basement of one of the school’s old brick buildings. Kim is methodically filing away at a rough-looking 8-inch blade he’s making for his final project in J.D. Smith’s bladesmithing class. It’s due tomorrow. “It’s gonna be an all-nighter,” says Kim, who knows his project is not bound for a museum. “More like a letter opener,” he says with a smile. Kim signed up for the class after hearing about its popularity. Other schools have metalworking shops, but Smith believes MassArt may be the only one in the country that offers an undergraduate major in bladesmithing. In the digital age, when nearly everything we do is mediated by a screen, Smith says the appeal of his craft — hammering red-hot steel into tools of fine art — is clear. He certainly had that hunger himself. Smith was well into a career as a working musician — a trombonist, he did gigs and sessions with acts from Dizzy Gillespie to Little Feat — when he came across an object that grabbed his attention and wouldn’t let go. It was an Indonesian kris, a traditional dagger with a distinctive wavy blade. The knife, which sat on the coffee table of an acquaintance, transported Smith back to one vivid day as a 10-year-old. Growing up an only child in Manhattan, he was given free rein to explore the city. On a warm August afternoon, he wandered through Central Park and ended up at the Metropolitan Museum of Art, where he was enchanted by a sword on display in the Arms and Armor Room. Smith at his forget at MassArt. After rekindling his boyhood fascination with ancient blades years later, he began reading magazines such as Soldier of Fortune. One of them featured an interview with Bill Bagwell, a master bladesmith who helped revive the lost art of forging knives with Damascus steel — the ancient technique of layering steel to create the mottled patterns that distinguish the style. Years after being mesmerized in the museum, Smith understood what he’d been gazing at. “I finally had a name for it,” he says. After studying at the Saugus Iron Works in the early 1990s, Smith served as an apprentice to Jot Singh Khalsa, who has been designing ceremonial Sikh blades, or kirpans, at an ashram in Millis for years. 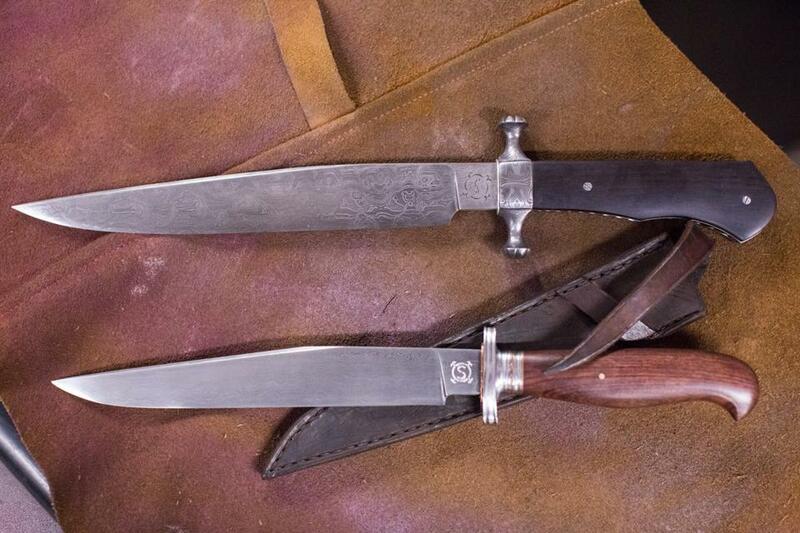 As a member of the American Bladesmith Society, Smith rose from journeyman to the rank of master bladesmith in 1998. 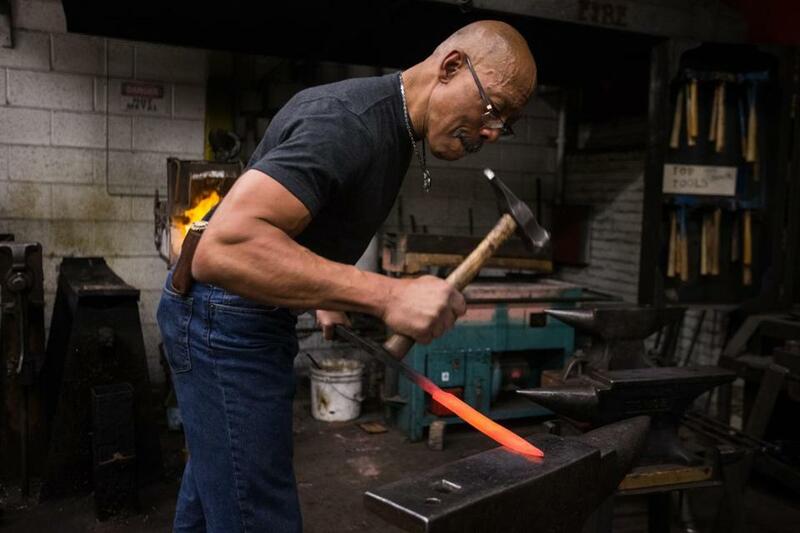 Not long after, he came to MassArt with an idea for the bladesmith program. Smith, who wears a diamond stud in one ear and a backward leather cap, works as he talks. 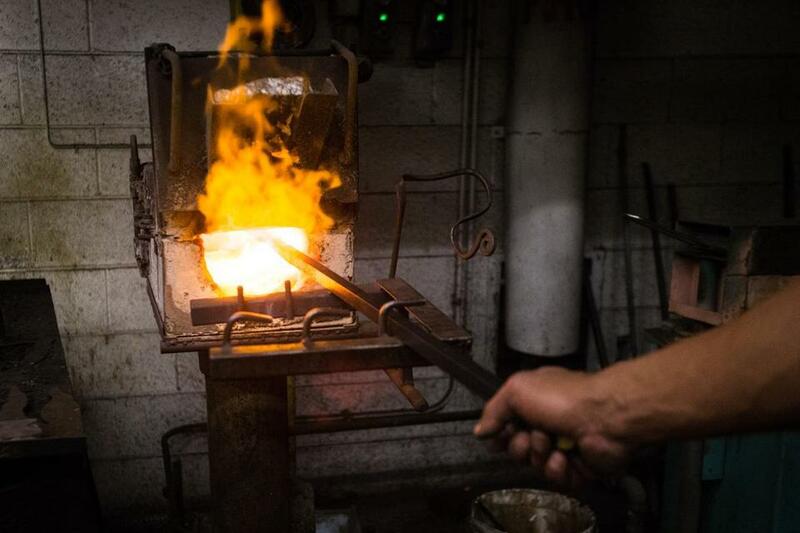 He pulls a steel rod from a gas forge about the size of a breadbasket, heated to 2,300 degrees. He lays the blade-shaped end of the rod on an anvil and hammers it, quickly and decisively, periodically inspecting the shape. As he hammers, his biceps bulge. Wearing jeans and a form-fitting T-shirt, he is at 66 remarkably fit, with a dancer’s small waistline. In fact, Smith took up dancing years ago. He’s had a colorful life. Smith’s strong will and his catholic interests have earned him a reputation as a unique kind of educator. He recently conducted the American Bladesmith Society performance test for former student Andrew Meers, who became a master this year at 31. Meers, a Holliston native now based in Tennessee, says he went to MassArt intending to become a painter, or maybe a sculptor. But after signing up for Smith’s class, he was amazed by the professor’s work. Some of the knives J.D. Smith has made. Over the years, at custom knife shows, Smith has reserved the right to refuse to sell his work to anyone with questionable motives. But like other bladesmiths, he is an advocate for the rights of responsible knife owners. A few years ago, while visiting a federal building to renew his passport, he had one of his own signature knives confiscated after he placed it in the tray at the metal detector. In an online forum, he vigorously defended his right as a “knife professional” to transport an “EDC,” or everyday carry. Smith recently moved his own shop equipment from the basement of his former home on Roxbury’s Fort Hill to Nashua, N.H., where he and his apprentice now share a workspace with Joseph Shnayder, a master jeweler who trained, Smith says, with Faberge craftsmen. They’re now producing fine art knives together. The gorgeous repeating patterns he creates by folding the steel are the rhythm. And the way the various elements of the blade come together to form the whole: That’s the harmony. James Sullivan can be reached at jamesgsullivan@gmail.com and on Twitter @sullivanjames.